Today I did not prepare lunch bento for the kids, because they ate school's catering. So I just made a small size bento snack for them. 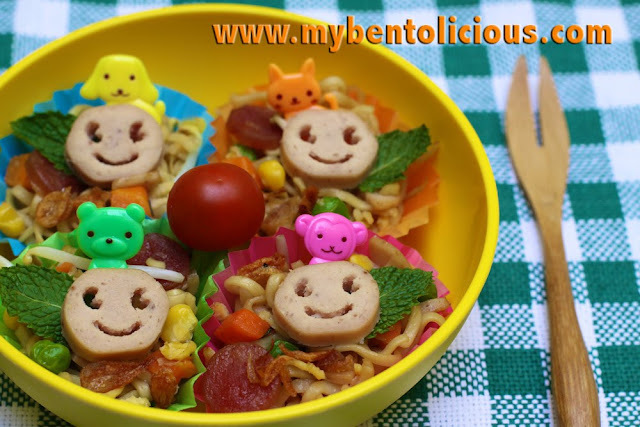 Snack bento contains fried noodle with pork sausage and lap-chiong (Chinese pork sausage). Then added some bean sprouts, carrots, peas, corns and thinly sliced omelete. I divided the noodle into 4 color medium size food cups. Put some smiley face sausages and mint leaves on the top of each food cup. I got my first award from Tata that made me very surprised and very happy too. Thanks a lot Tata for the award :o) Anyway this blog is still baby but I will keep posting my bento regularly to share it with everyone .... Now is the time to choose another 15 new-to-me blogs to pass on this award. 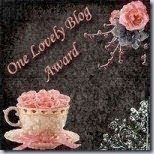 I put the list below the award icons and had notified the 15 blog owners to pick up the award here. Hi Lia, what a nice surprise to be recocognized by you with this award. I'm honored that you've listed me along with the other outstanding bloggers. Thank you very much and I look forward to reading more of your posts as you have a terrific blog. You knw wat, this is the first time am recieving an award. Great!!! !